The Mt. Huashan (华山 Huashan) is well known for high mountain range, steep cliffs and narrow paths. It has five peaks: East Peak, South Peak, West Peak, North Peak and Middle Peak, each has its own character. 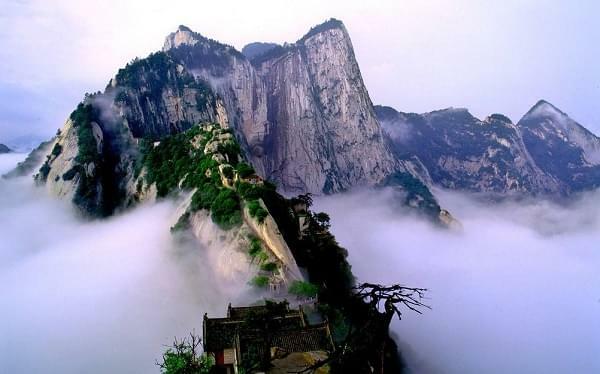 You will enjoy a full day trip to Huashan Mountain accompanied by experienced guide and driver. It will take about 2 hour from Xian to get to Huashan Mountain. You will visit all five peaks with round way cable car. 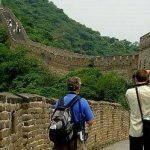 Depart from your hotel/railway station at 8:00am in Xian and relax during the scenic journey to the Mt. Huashan (华山) by private car. It is 120 km and about 2 hours drive to the foot of the mountain. You will take cable car to the North Peak (北峰). There are steep cliffs on three sides and south side with hill leads to the other four peaks. 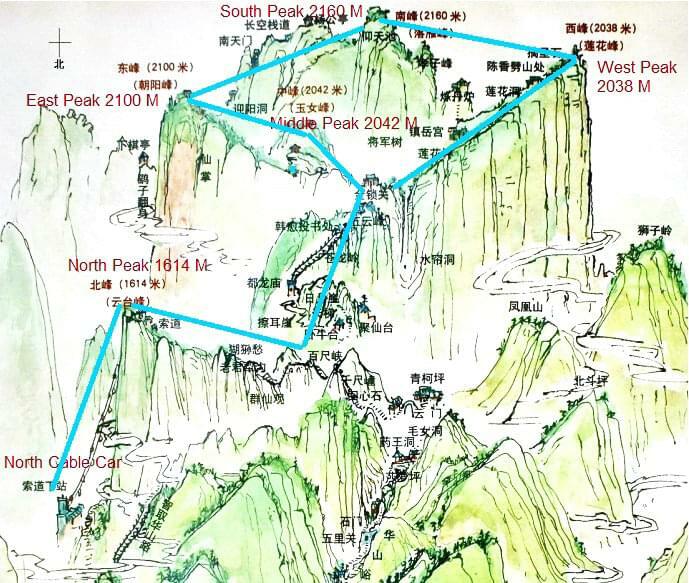 climb up the Ear-Touching Cliff （擦耳岩）, Heavenward Ladder (盘天梯)， Black Dragon Ridge（苍龙岭) to reach the Golden Lock Pass(金锁关) and visit Middle Peak (Jade Maiden Peak 玉女峰)，the East Peak (Facing Sun Peak 朝阳峰). Then hike to the South Peak (Landing Wild Geese Peak 落雁峰). 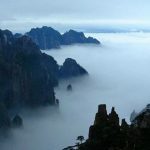 The South Peak is 2,160 meters above sea level, the highest peak of Mt.Hua. You can show your courage at the most dangerous famous Changkong Plank Trail (长空栈道), a 0.3 meters wide plank path built along a bottomless vertical cliff. 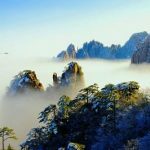 Then finally the West Peak (Lotus Flower Peak 莲花峰)，the West Peak is the symbol of Mount Hua, it is the most spectacular one of five peaks and a must-visit for Mount Huashan visitors. Take the cable car down the mountain and return to your car for the journey back to Xian. The prices above do not apply to Chinese festivals such May Day Festival, Spring Festival, National Holiday. 1. Private car or van with experienced driver. 2. Private English-speaking tour guide. 3. Entrance tickets to tourist spots mentioned above. 4. Cable car up and down the North Peak. 1. Advise to prepare some snacks and bottled water for lunch as the food on mountain top is very expensive. 2. Wear warmer clothes as it is cooler on mountain top, prepare a good pair of hiking boots or walking shoes. 3. The mountain has many dangerous passes, be very careful on the passes. 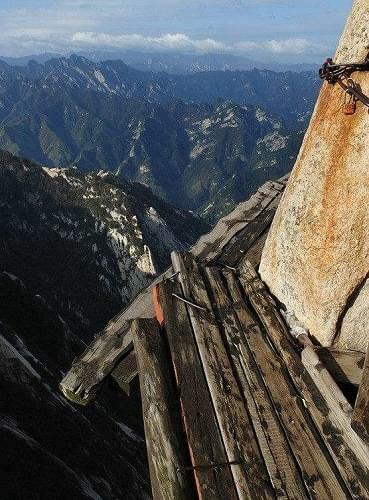 climbing is not recommended during major Chinese holidays. 4. The best visiting time is from April to October. 5. A map of Mt. Huashan can make your visit major scenic spots along the journey. 1. Mount Huashan (Chinese: 华山; pinyin: Huà Shān), is one of the famous Five Great Mountains in China. The other four are the Mt. Taishan, Mount Hengshan (衡山), Mt. Hengshan (恒山) and Mt Songshan. 2. Mt. Huashan is 120 kilometers east of Xian and about 2 hours drive. 3. The mountain is huge complete granite. It is known for its breath-taking crags, steep trails, it is one of the most precipitous mountain in the world. 4. The mountain has five main peaks: The North Peak, The East Peak, The South Peak, The West Peak and The Middle Peak. The tallest is the South Peak at 2160 m.
5. It takes about 24 hours to hike all the five peaks and about 5 – 6 hours by cable car. Hello, I would like to do the Mount Huashan tour on the 13th May. Would it be possible to join a group already going? I can not afford the price of a single person trip. I am getting the sleeper train at 7pm, would I be back in time to do the tour and get my train?